After a good breakfast at Twin Rocks diner in Bluff we drove to South Mule Canyon for a day walk to look at some Anasazi ruins. Flaming Roof ruin was the best, living up to its name with its impressive streaky sandstone overhanging roof. Whilst here though we both agreed that backpacking for a few days suited us better than day hiking and allowed more of an immersion into the backcountry! So we decided to visit Dark Canyon further west and drove off mid-afternoon back to the basic Hite marina campsite at the edge of Lake Powell. Some eerie coyote choruses overnight including some right next to the tent. A guy drove into the campsite last night and asked if there were any shops or diners nearby (Hite is a looong way from shops with Hanksville or Blanding being maybe 90 minute’s drive away). Martina gave him 2 snickers for the road and he set off for Hanksville! Drove down in the morning to the Sundance TH- 11 miles of dirt road with beautiful vistas including the Henry Mountains prominent to the west and Sigor Ros on the stereo – superb! This road is also used as part of the Hayduke trail to hike between Dark Canyon and Hite and then onto the Dirty Devil river. On leaving the car, we hiked for about an hour using the Hayduke route variation from the trail on a nice faint line through pinyon juniper and some cool slickrock before reaching the beautiful rim of Dark Canyon with horizontal layers and towers below. Three ravens and a raptor swooped above to complete the scene. The descent was steep, down bouldery and sandy ground, but at least is well cairned. We took it slowly and were down to a sub valley that feeds into Dark in an hour. After relaxing behind some massive boulders we moved on down the sub valley on good trail to cottonwoods and Dark Canyon itself with a healthy flowing river (rangers had warned us there might not be water here but that seemed unlikely with this major river system!). Our aim was to hike Dark Canyon upstream to the junction with Youngs canyon and set up camp to explore- this again being part of the Hayduke trail that we hadn’t yet seen. This was a fantastic walk, often on limestone pavements above the river shore providing a mix of easy walking mixed with scrambling. The pavement terraces were often undercut and embedded with red, white and black cherts (we think) in a beautiful abstract array. Fossils appeared now and then too. With the water often pouring down slabs forming pools and waterfalls, we managed one cold dip but it was fun. The canyon was deep with high open walls blocking the sun out much of the time- perhaps where the ’Dark’ name comes from? At one point we hit a dead end in the canyon and were forced to back track until we could scramble out the west side before picking up a cool trail following the rim upstream. Nearing Young’s canyon we hit some slower travel, more lush vegetation and bushwhacking before we arrived at the atmospheric confluence with Youngs canyon and set up camp with Youngs waterfall cascading nearby. Great day! Weird limestone terraces – intrusions? We decided to leave the tent in place and explore Youngs Canyon today. To get into the canyon we bypassed the waterfall by going 100m up Dark Canyon then taking a steep cairned trail before traversing back into Youngs above its pool. Soon after we hit a deeply vegetated patch thick with poison ivy and bamboo- bashing our way through we were glad it only lasted a few hundred meters before we emerged out into a dry canyon. From here we scrambled up the canyon floor on slabs and over boulders. Staying in the canyon we arrived at a beautiful slabby rockwall which we climbed before being halted in our tracks by another steeper 20m wall. We backtracked 400-500m down canyon to reach a cairn at a side gully and scrambled our way up past a tower on the east to pick up a rough trail contouring up the canyon rim. Following this for maybe a mile it dropped us back into canyon floor where we continued upwards. Lunch was under some cottonwoods in an open section of the canyon at the foot of the cairned route taken by the Hayduke onto the rim again far above. 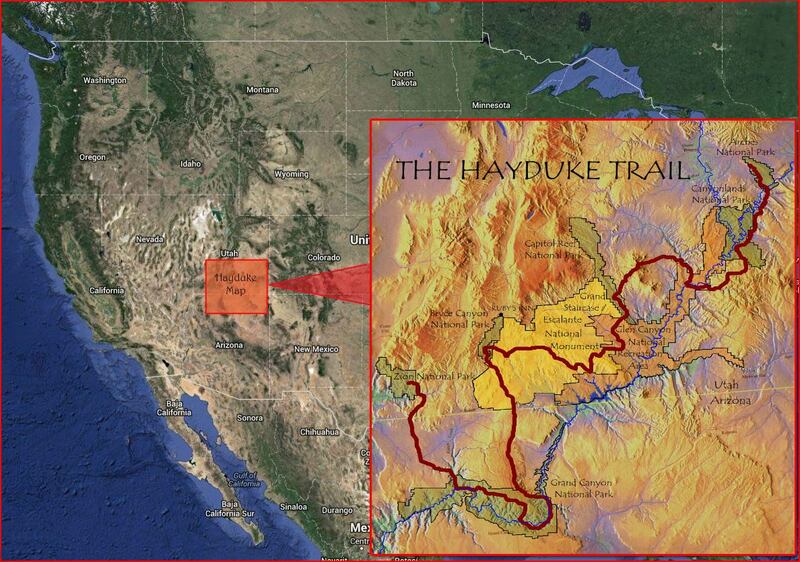 The Hayduke does a big detour from the canyon floor here to avoid a dryfall above. At 2pm we turned back and this time stayed on the eastern rim trail as it went past the tower, round the rim of the side gulley and on another 500m or so to a cairned descent steeply down a rubbly scooped gully. This went better than expected and we were soon back in the canyon to scrabble through the vegetation before returning to the tent at 4pm. The rim route on our return was much quicker. Overall the section of Youngs we looked at was wild and scenic. After dinner Brian explored up Dark Canyon from the Youngs confluence and again it was interesting with a more chilled, tranquil vibe. After a warm night we had a brief rain shower at breakfast and once it stopped we decided to both head further back up Dark Canyon and leave the tent. The meanders are tight upstream and we both loved the mellow feel with a gentle stream flowing. There is an attractive large pool which we bypassed on the right going upstream. After about 1.5 miles from the Young’s junction the water stopped flowing and we went another couple of miles before turning back. It would be great to include upper Dark Canyon in a future longer hike- perhaps on the Hayduke alt from Salt Creek or joining into Woodenshoe canyon going south. Returning to the tent, we packed up and headed back downstream in Dark Canyon. Repeating this stretch was no hardship as it’s so great! We found an excellent place to pitch the tent on a rocky limestone terrace right above the river. Heard a dipper and canyon wren on the way. In the morning we hiked back down to the junction with the Sundance Trail after taking a short diversion up Lost Canyon which was also rather scenic. Met a couple of hikers from Flagstaff camping on the way. From there we decided to explore down the lower part of Dark Canyon to where it flows into the Colorado river. The canyon walls close in a little after the junction with Lean To Canyon and after a false attempt on the left, we retreated and climbed up to a trail on right/east of the canyon (LDC). This was a fantastic high ‘balcony’ trail with short exposed sections and tremendous views downstream. After about an hour the trail drops down steeply to the valley floor at the junction with a side canyon from the east- a lovely spot with water sliding down bare slabs. From here we downclimbed past a deep, beautiful pool on its left and then scrambled up right past some loose blocks. Then things got muddy! Lake Powell must have reached up to here in the past but the lake has since retreated back leaving the valley floor filled with mud and silt making for stodgy going! The temperature built up too and we plodded on but eventually turned round about 300m short of the Colorado river itself. Going back upstream was easier and again a great hike- we thoroughly recommend this lower part of Dark Canyon. Made it back to the juntion with the Sundance Trail at 3pm in hot, sultry conditions. After a drink in the shade of cottonwoods we shouldered our packs for the steep, hot climb ahead to the rim. Made it back to the car at 5.30pm after another great scenic trip. Drove to the metropolis of Blanding for a motel and pizza!